Make these easy, fun crafts and activities with your kids and march around the house for a sparkler free holiday. Build a Felt American Flag for Fourth of July ~ Easy for Preschoolers (Tip: You can make it with construction paper too.) This craft from Little Family Fun is easy and giftable too! Felt Flag Craft for The Fourth of July. 2. MeloMomma has a super cute Uncle Sam paper craft perfect for Preschool Kids. Sorry, this website is no longer active. This is a good blogging lesson. Save the images and upload them with links. If you copy the url of an image and it gets removed, you have broken links. We'll make our own soon and replace this image. 3. Craft your own RED, WHITE, and BLUE windsock from plastic tablecloths and hoop. This easy Fourth of July craft is from Multiples and More. Make a windsock from strips of plastic table cloths like this one from Multiples and More. 4. Use recycled shopping bags (Target is cool) to make an Independence Day Parade like this one from The Zui Blog. Make a baton from plastic retail bags like this one from The Zui Blog. 5. Make a Firework Hat go to Tippytoe Crafts for the How to. How to make a Firework hat craft for Independence Day. 6. We've got two easy crafts from toilet paper rolls (cardboard tube crafts). Both can be filled with candy and goodies for party favors. 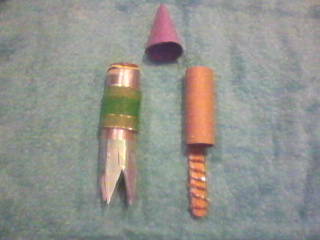 Uncle Sam Hat craft and Rocket Popper craft. How to make a rocket craft for kids. How to make an Uncle Sam hat.